Physical bookmarks are very useful because many of us aren’t able to remember exactly what page we left off at when reading. Bookmarks in Web browsers mirror this functionality by allowing us to save particular Web pages that we have visited. Whether the page was very useful, or we simply didn’t have enough time to read it, saving a page to your browser is a lot easier than trying to remember the sequence of searches and clicks that ultimately led to that page. Maybe you have been using bookmarks in browsers on your desktop or laptop computer for years, but have started doing more and more of your browsing on your phone. Fortunately you can continue to use bookmarks in the same way, even if you are using a third-party Web browser like Firefox. 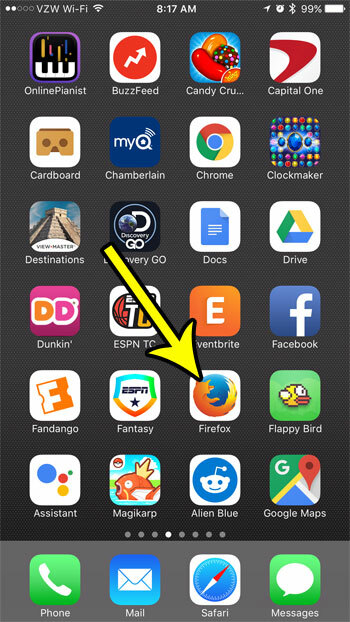 Our guide below will show you how to start bookmarking pages in Firefox on your iPhone. The steps in this article were performed on an iPhone 7 Plus in iOS 10.3.2. This guide assumes that you have already installed the Firefox app on your iPhone, and that you want to be able to bookmark individual Web pages so that you can reference them more easily in the future. 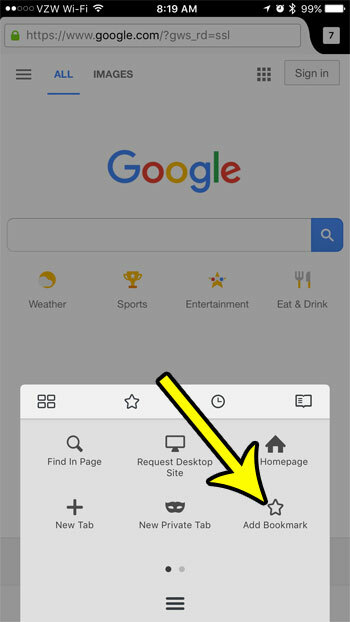 Step 1: Open the Firefox app and navigate to the Web page that you want to bookmark. Step 2: Touch the menu icon in the middle of the bar at the bottom of the screen. 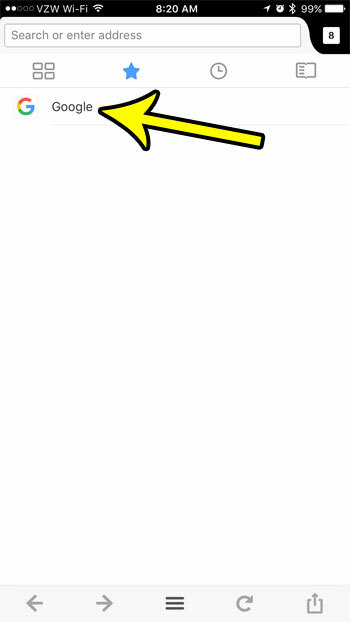 It’s the icon with three horizontal lines. Step 3: Tap the Add Bookmark button. You can then navigate to a bookmark by opening that menu again, but tapping the star icon at the top of the menu. Then tap the description of the page that you bookmarked to be taken to that page. Most other Web browsers will allow you to store and navigate bookmarks, including Chrome. 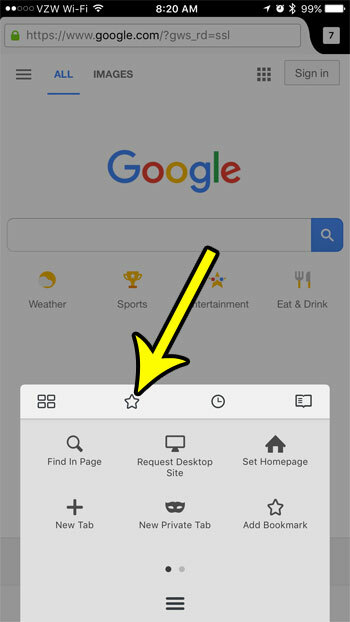 Learn how to bookmark in the iPhone Chrome app if you often use that browser on your device as well.